Intuitive healing means tuning into your organs to identify any imbalances within your temple. The body sends you signs when your health needs extra care. Headaches, back pain, dizziness, muscle tension, fatigue, upset stomach, dry mouth, chest pains, frequent colds, and even irritability are all red flags that something deeper may be wrong. There are many ways you can accelerate natural healing just by paying attention to your temple. Communicating with your body combined with reflexology has proven to be highly effective in healing ailments and dis-ease. On my personal journey of self healing I’ve found that my skin is extremely helpful. My skin reacts to any foreign substance taken internally or externally that my cells have to work harder to break down. I found that repeated dry spots, acne, etc. that reappears by the season, stress, or even around menstruation at the same spot on the temple is a direct connection to different organs. Your liver, kidney, intestines, heart, etc. are literally communicating with you through your skin, and interestingly enough the face to be specific. Dry spots, red spots, acne, and rashes on the face acts as a map. 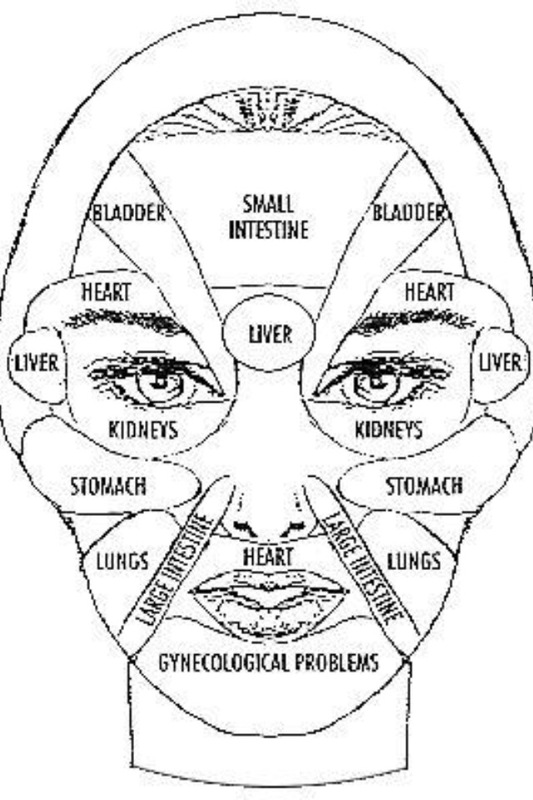 Below is a face skin chart reflecting the organs each area represents. “African Holistic Health” by Llaila Africa is a great book to refer to if you are interested in learning more.